In my pre-vegan days I gravitated to the sublimely saucy French fare like Beef Bourgignon, Coq Au Vin, and Bisque de Langouste. The base of most of these stews is, of course, meat, chicken, and fish so adieu, adieu to yieu and yieu and yieu. I was thrilled when I tripped over this recipe for Tempeh Bourgignon in the Moosewood Cookbook. They hit the nail on the head when they say that not only is tempeh low in fat and high in fiber and protein, it also has the wonderful ability to soak up flavours. You mean like mushrooms, red wine, garlic, and thyme? 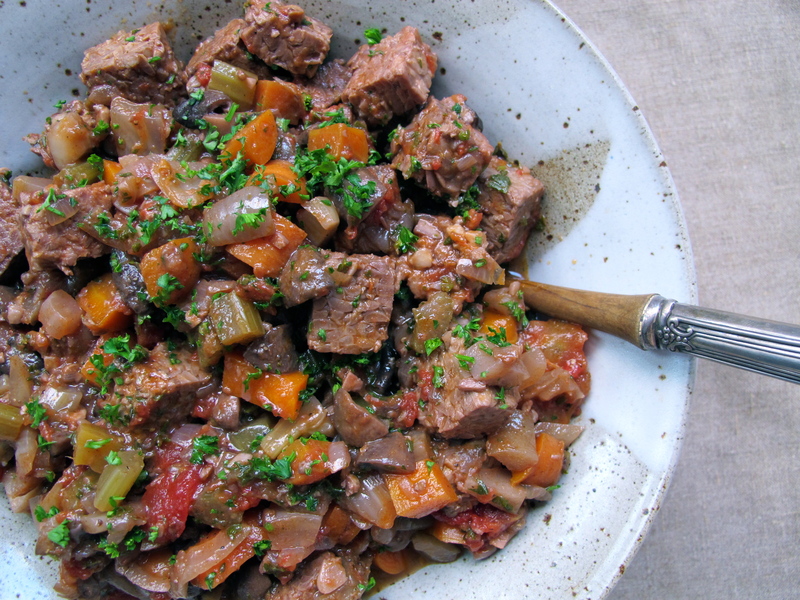 I say bring on the tempeh in this bourgignon classic. In a saucepan on medium heat, warm the olive oil and cook the onions until tender and browning. Add the garlic, bay leaves, and salt and saute until the garlic is fragrant, about another 5 minutes. Add the celery, carrots, fennel, and mushrooms and cook, stirring frequently, until the mushrooms being to release their juices, about 10 minutes. Deglaze with the red wine. Let simmer until the wine reduces slightly. Add the tomatoes and tempeh and bring to a boil. Reduce heat and simmer, covered, for about 20 minutes, stirring occasionally. Stir in the dijon, thyme, additional sea salt and pepper to taste. Let simmer for another 5 minutes or so. When the stew is done, stir in chopped parsley and serve over garlic smashed potatoes, with a crisp kale salad on the side.